I write of these two days together, as they were not specifically hiking or touristy days, but were intended to get me to gatherings honouring Abdu’l-Baha, on the Centenary of His visit to North America. Specific to yesterday and this coming weekend, we commemorate His visits to Glenwood Springs, CO and to Salt Lake City. Logistical concerns led us to observe the visits in reverse chronological order, so Salt Lake City had its observance last night. 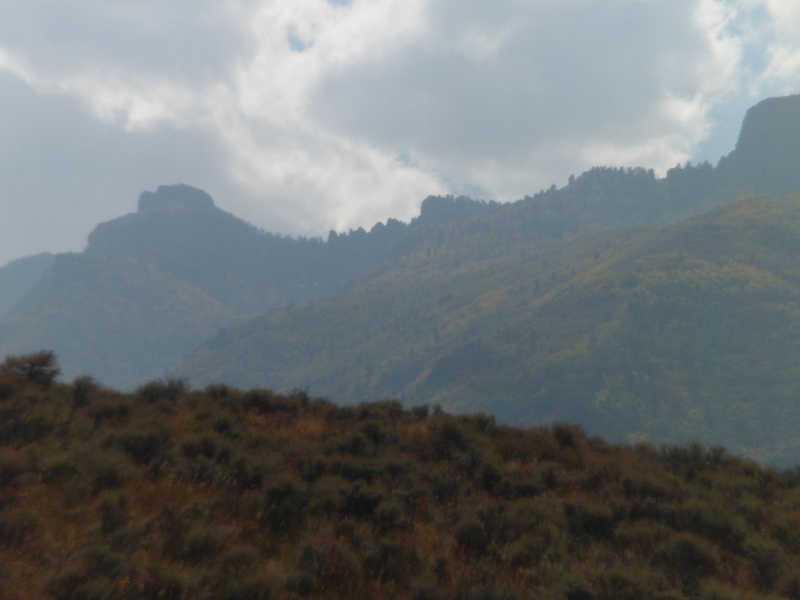 I set out from Elko in early afternoon, after taking an hour or so to visit the area’s signature Ruby Mountains. Enjoying a picnic lunch by a burbling creek or river is always one of my life’s pleasures. Here are a couple of reasons why a trip to northeast Nevada is delightful: The crest of the Ruby Mountains and Spring Creek, with its picnic ground at Power House. The Ruby Mountains are the westernmost of three ranges that rise up from Nevada’s Great Basin. Heading east to Wells, one encounters the Humboldt Range and near Wendover are the Silver Island Mountains. 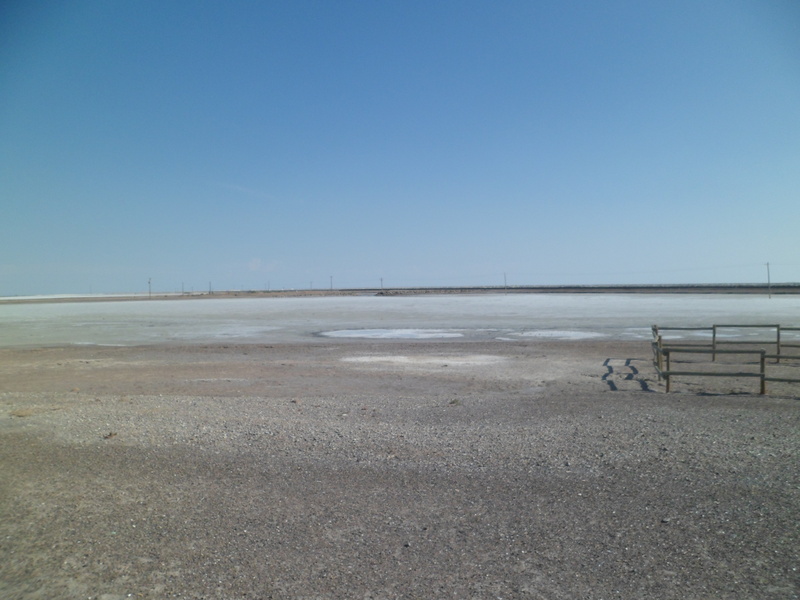 From there, entering Utah, the mountains trail off to the north of I-80, and we are greeted by the Bonneville Salt Flats which, with the Great Salt Desert, make up the remains of ancient Lake Bonneville. This area also fades, after about 50 miles, and scrub desert alternates with the foothills of the Wasatch, closer to Salt Lake City. I was pleased to reconnect with one of our old friends from the Reservation days- who was actually with Penny, the night she and I first met. 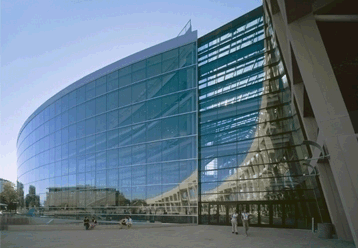 About 120 people attended the commemoration event, held in a conference room on the fourth floor of Salt Lake City’s magnificent Central Library. I give you a file photo of that structure. 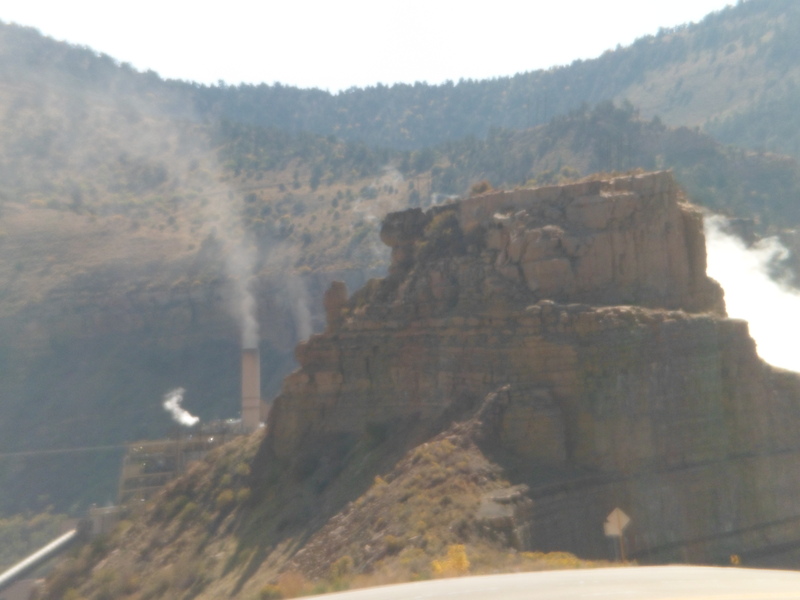 After a great night’s sleep and hearty breakfast, we headed out towards Glenwood Springs. I traveled alone, but no matter- we will all be together tomorrow and Sunday. 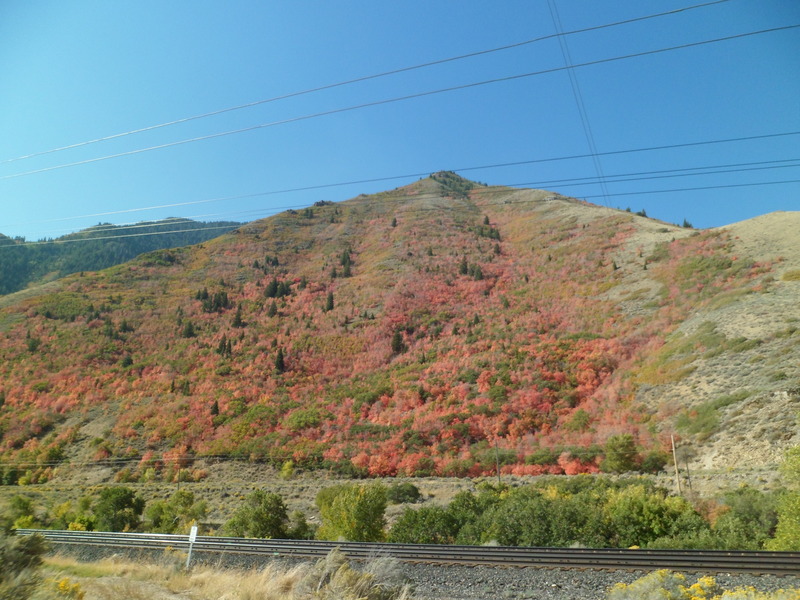 En route, I was amazed to see autumn foliage in Spanish Fork Canyon. This sort of scene would repeat itself, along with stunning rock formations, in underrated, but fabulous Price Canyon, about sixty miles southeast of the Salt Lake Valley. My lunch was at a rest stop in Horse Canyon, just north of Green River, UT and I-70. My journey through the rest of the Great Basin, in Utah and Colorado, led past the turnoff to the Utah of legend: Arches, Canyonlands, Capitol Reef, etc. and thriving, lovely Fruita. Then came Grand Junction, Grand Mesa and the winding Colorado River. These will have their own share of my time, later on. Glenwood Springs will be my home for the next two days. Yesterday, I spent the entire morning examining the course of my life, with the help of a dear friend in Reno, and while writing my post about Day 5 of this return trip. Since Penny passed, I have been occasionally influenced by friends and family to attempt certain ventures or go in a certain direction. Yet what remains most important to me is my relationship with the Creator. All else needs to be weighed against that. It follows that, since God and Baha’ullah value family, an ordered but inclusive society, based on justice and the unification of the entire planet, people need to follow certain basic rules. We tend to not like rules. They make us uncomfortable, often require sacrifice of individual wants, for the common good and sometimes appear, on the surface, to be at variance with individual freedom. I long ago came to the conclusion that no freedom is without serious cost. On planet Earth, and probably elsewhere in the Universe, wherever there are sentient beings living together, there is a medium of exchange. Actually, there are several, money and barter being the pecuniary ones. Courtesy and reciprocity are the social ones. The medium of exchange between Creator and created, in my humble opinion, is the Creator gives us nearly limitless resources, opportunities to grow spiritually and boundless love. 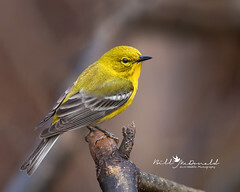 We, in turn, listen to His Messengers, follow certain rules and desist from whining, cursing and rebelling when things contrary to our wishes are mentioned in those rules. All this, and more, came out of the conversation I had with my friend, Michele, yesterday morning. Had her husband, Tom, not been working, and been present, he would have most likely concurred with us. Obedience to the laws of the Universe imparts benefits, personal growth and long-term happiness. Rebellion and “the insistent self’ impart angst, doubt,depression and near-constant anger. 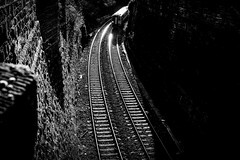 We have free will, though, so we get to choose which of the two paths to follow, and God won’t decide for an individual which path he or she walks. Most of us dovetail between obedience and rebelliousness. I know I have, and I also know which path has brought more satisfaction to my life. 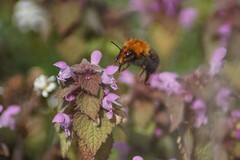 It has its own vibrancy, though, this seeming wasteland. The people here are self-reliant and live by the type of sentiment I saw posted in a restaurant in the northeast Nevada commercial hub, Elko: “The best place to be is together.” I would say that’s true, both in terms of individual sensibility and of social connectedness. 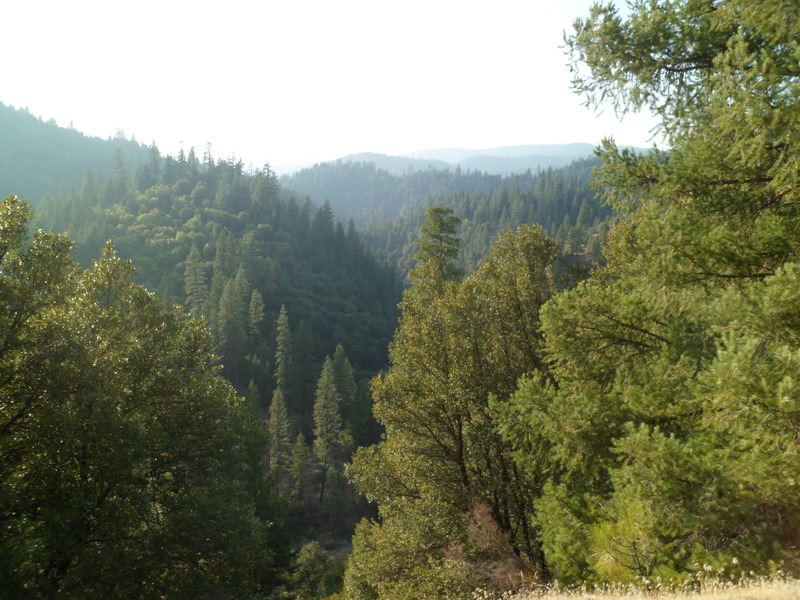 It has its water sources, like the Humboldt River, and the Truckee. En route to Elko, I passed by Battle Mountain, a testimony to the struggles between the Shoshone and the Euro-Americans in the latter part of the 19th Century. In Elko, I found a clean, friendly and eclectic community. The hall of justice is its most prominent building. Elko has its share of casinos and some hidden gems, like the restaurants on East Fifth Street, of which I chose Mc Adoo’s for breakfast, on this morning of Day 8. The little sign in the photo, and the aforementioned quote, say it all about this unassuming little nook and the lovely couple who run it. Next up: Day 8- On through the Great Basin, to Salt Lake City. After shaving by using my side view mirror, and saying a few prayers, I left Lake Britton and had a decent breakfast at Fireside Village, in the small town of Hat Creek, CA. 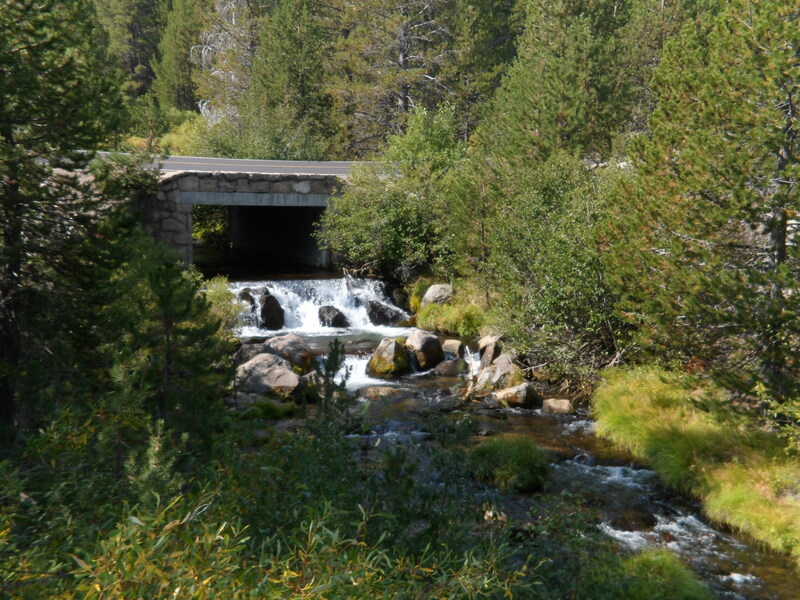 The creek for which the town is named is an integral part of the Mount Lassen drainage area, as is Kings Creek. I arrived in Mt. Lassen Volcanic National Park around 9:30 A.M. and spent six hours there, enjoying the contrasts- from lushness to austerity. We are greeted almost immediately by the great peak, with plenty of the legacy of its 1915 eruptions, much in evidence. I looked around Loomis Museum, which features a seismograph that records all tectonic activity in the area, with photographs taken by B.F. Loomis, right after the eruptions of May 19 and 22, 1915. Comparative photos are also shown of the area, both before the eruptions and several years after. It is noteworthy that Lassen Peak is the southernmost volcano in the Cascade Range, with the Sierra Nevada beginning closely to the south. 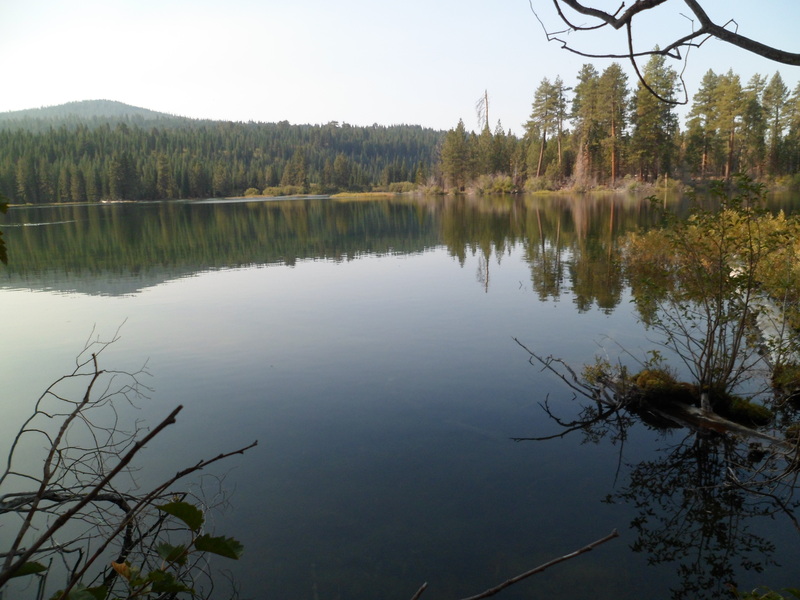 Not far from the museum is Manzanita Lake, which, along with the aforementioned creeks and other lakes to the north of Lassen, sustained several Native American tribes in the area. Native crafts are well-displayed in the museum, along with the story of Ishi, the purported last member of the Yahi Tribe, who lived west of Lassen Peak. Here is a view of Manzanita Lake. 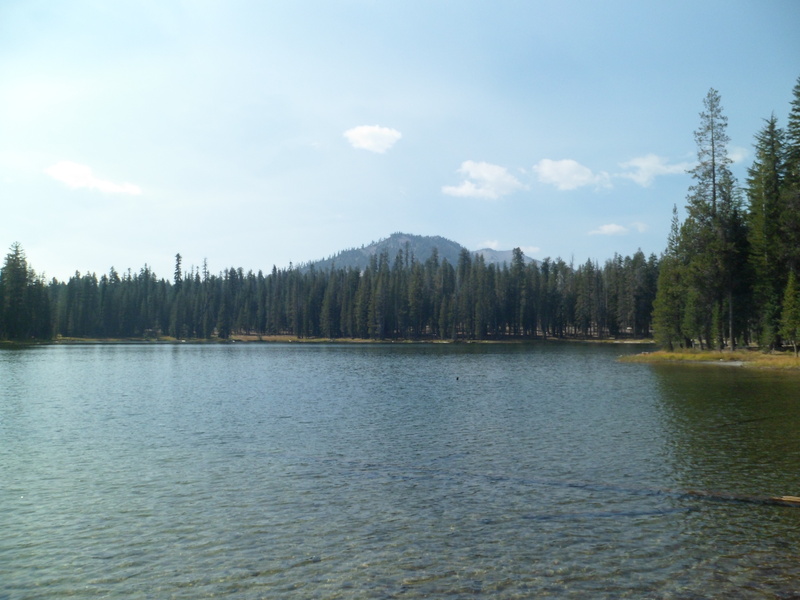 If I come back to Lassen, it will be to spend a couple of days in a cabin at Manzanita Lake. 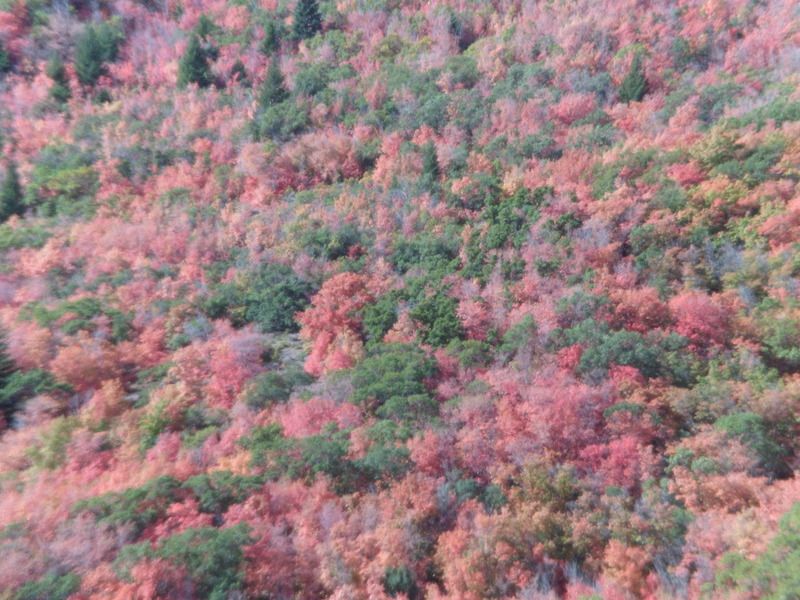 The forest has suffered this past summer, from lightning-caused fires. There are several areas of the park that are still closed to the public, and fire crews were much in evidence along the main park road. West and north of Summit Lake is the main hot spot area. Still, the damage caused by rock and magma far surpassed that done by forest fire. Here is a rock field, just east of the Manzanita Visitor Center. There are four basic types of rock at Lassen: Basalt, andesite, red dacite and gray dacite, (shown below). 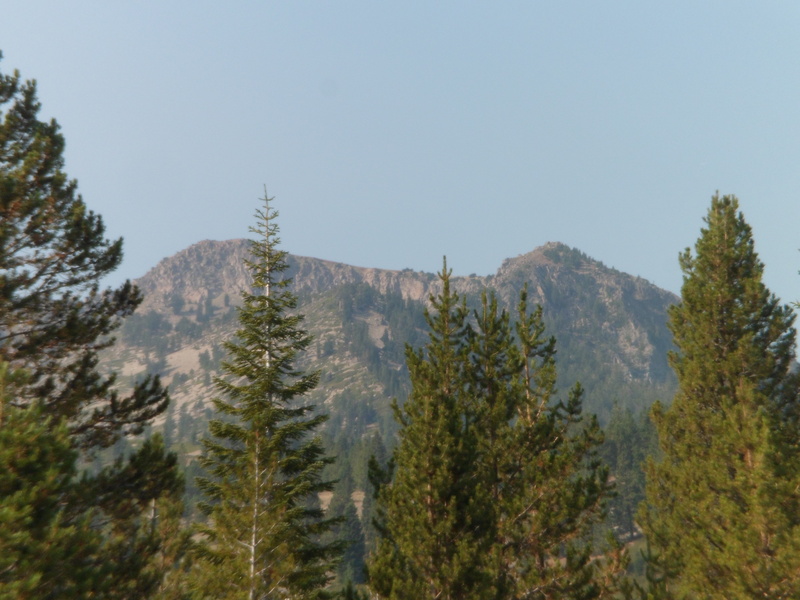 Lassen Peak may be hiked, to a point within 1,200 feet of the summit. After that point, the tuff underfoot becomes too treacherous, and is thus closed to hikers. Several boulders are on display in the Devastation Area, site of the worst damage from the May 22, 1915 eruption. Below is a red dacite specimen. I spent an hour or so in the Summit Lake area, enjoying a light lunch and another beautiful lake. An 11-mile hiking loop is available from Summit, on another visit. 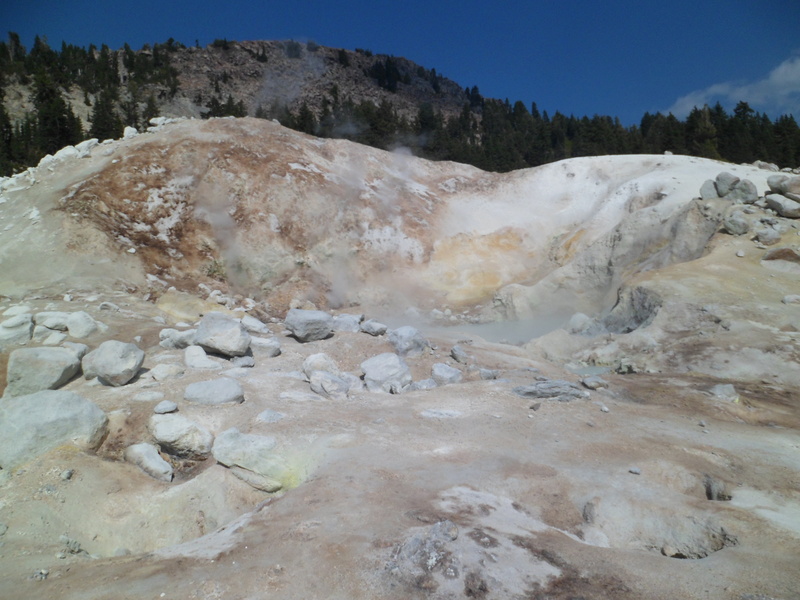 The piece de resistance, however, is an unexpected sight, with an even more unlikely name: Bumpass Hell. Kendall Bumpass, a cowpoke from Hat Creek, found this area of mud pots and boiling springs, which have an average temperature of 200 degrees Fahrehheit, in the 1890’s. He lost his own left leg to an unstable patch of boiling soil. 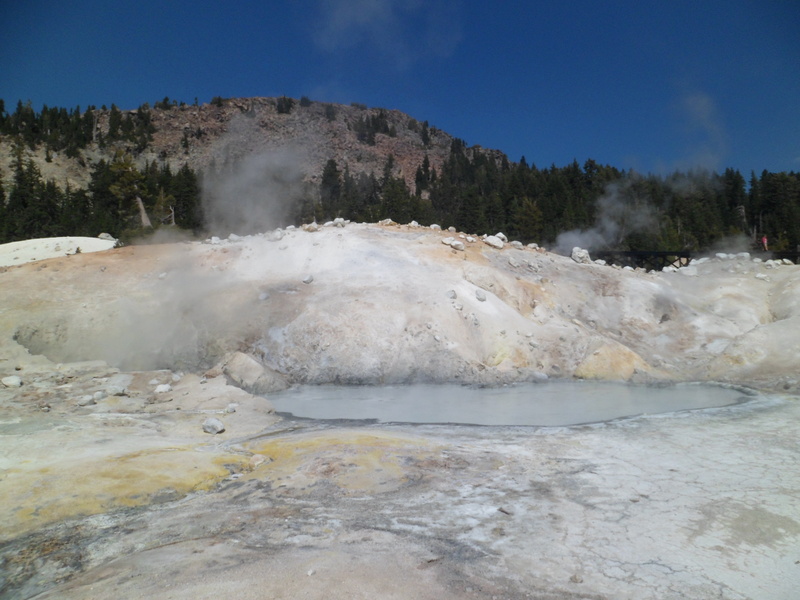 Bumpass Hell is the largest of five hot spots in Lassen Volcanic National Park. At the edge of heat and sulphur, small plants, like this purple heather, thrive in patches, uptrail from Bumpass Hell. I would spot more awe-inspiring scenes, beyond Lassen, in the Spanish Creek/Feather River Gorge area, north of Lake Tahoe, on the way to Reno, and another visit with my friends. Lassen Volcanic National Park was the fourth California site to be designated a national park. It remains among the most eclectic. Monday, Sept. 24, found me waking up in one of the finer places in which I’ve stayed, hotel-wise. Union Spring Resort has several cabins, which are in reality country houses, along the upper Rogue River, east of Prospect, OR. I could easily stay here for several days and just relax, albeit sans TV- which I have done more often than not this trip, anyway. Here is the cabin I used the other night. The folks here were as gracious and helpful as any I’ve met, anywhere in the world- and the Rogue River Gorge is a spectacular backdrop. It’s quite apparent why the Rogue is a favourite of white water rafting buffs. 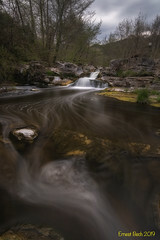 I stopped briefly downriver, at Mill Creek Falls, closer to “downtown” Prospect. The Rogue River defines so much of what makes this southwestern sliver of Oregon’s interior, one could easily, as I said initially, spend days in relaxation and meditation. I continued, through bustling Medford, to the laid back ambiance of Ashland, interior southwest Oregon’s southernmost town, and a haven for theater, especially Shakesperean theater. The Ashland Springs Hotel is among the tallest buildings between Portland and Santa Rosa, if not San Francisco. I waited briefly here for my friend to appear. The staff here were very warm, in greeting the various guests, and phone inquirers, who happened along while I was waiting. Once Jody arrived, we went by the Elizabethan Theater, and its two satellite theaters. This is the nation’s oldest Shakespearean venue, and is an outdoor theater-in-the-round. The Shakespearean Festival takes place for several evenings, right around this time in September. We had a fabulous lunch at Greenleaf Restaurant, along Ashland Creek and in the central plaza. It was hot in Ashland that afternoon, but the creek made a big difference in comfort level. I will caution against drinking much, if any, of the lithium water that is available on the plaza, for tasting. I gave it a shot, in sporting fashion, with no ill effects. Lithium water is what it is, though. After lunch, before Jody had to leave, we sat in Lithia Park, by a duck pond, and discussed life in general. 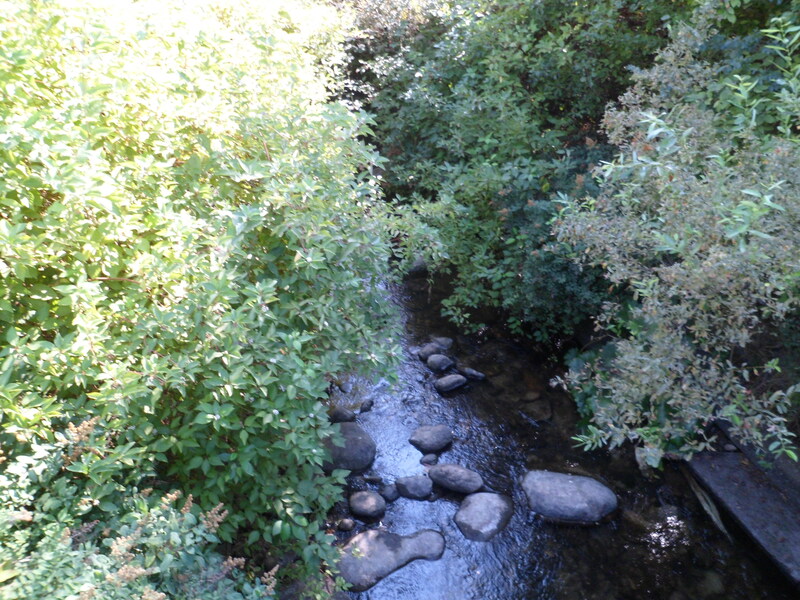 After Jody left, I went back to Lithia Park and explored a bit further. Some resident deer had captivated a woman, who was hiding behind a post, so as to get several photos of the creatures. I found a blind of my own, and took the animals’ portrait. 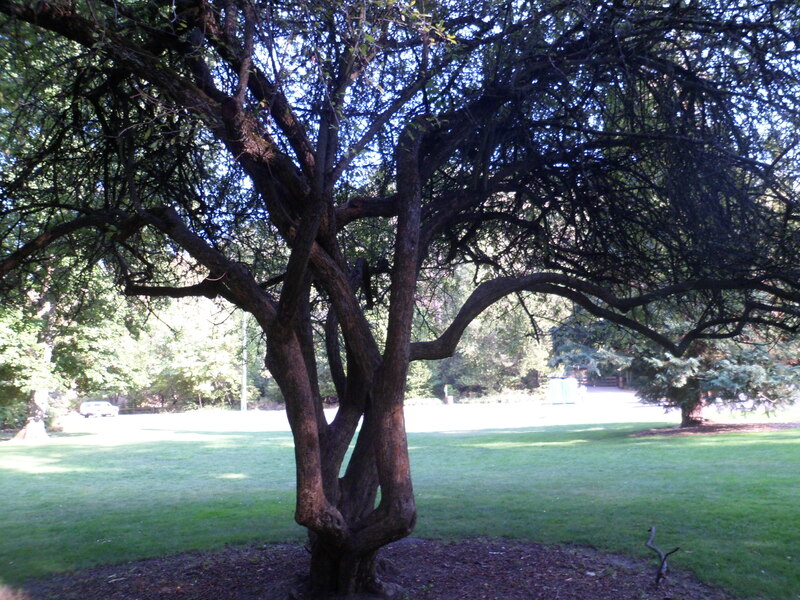 There are numerous small gardens within Lithia Park as well. My days tend to start early, get taken up longer than I expect, with posting and other aspects of my routine (praying, etc. ), so before I know it, it’s mid-afternoon. I returned to my car, gassed up and headed towards Mt. Shasta and the small town of McCloud, CA. , which sits serenely at the great dormant volcano’s foot. Here is a northern view of Mt. Shasta. Below, is McCloud Hotel. Mt. Shasta is more clearly visible from this southeast viewpoint. 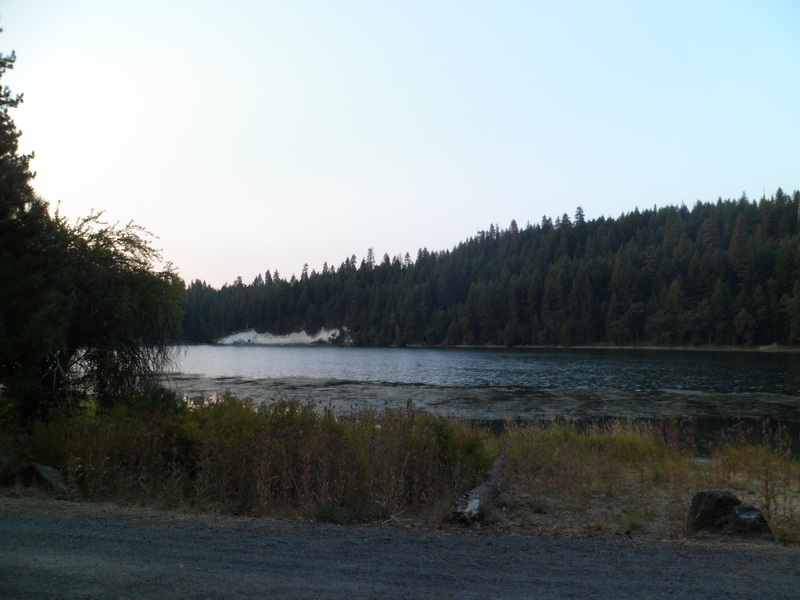 Finally, I found Lake Britton, and a campsite operated by Pacific Gas & Electric Company, on forest service land, east of Mt. Shasta. This gave me the perfect amount of solitude, which I rarely crave, but needed on Monday evening. Next up: Lassen Volcanic National Park. Leaving the Central Oregon KOA, in Culver, just north of Redmond, my itinerary for the day was Bend and Crater Lake, with an overnight stop somewhere in the Rogue River Valley. I did not figure on three of Oregon’s best kept secrets. Ogden Memorial Park, on the south edge of Culver, captures Crooked River Canyon. It is named for Peter Ogden, the hero of the Whitman Massacre and founder of Ogden, Utah. Also memorialized here is Navy Lieutenant Rex Barber, a native of Culver, who shot down the airplane carrying Admiral Yamamoto, in World War II. Smith Rock overlooks the town of Terrebonne, just north of Redmond and Bend. Here is the middle of Volcano Alley (my term for central Oregon), with Mt. Jefferson and the Three Sisters winking back, from the west. At Smith Rock State Park, hundreds of Oregonians and visitors busied themselves with hiking, jogging, rock-climbing and just plain gawking, in an environment not unlike several in central or western Arizona. Below, is the aptly-named Crooked River. Rock climbers were numerous, on this bright, blessed day. I hiked down to the river and along its banks for a while, before heading to Bend, central Oregon’s burgeoning hub. Bend has a fine reputation as an interesting recreation center. Stopping for lunch at Sidelines Sports Bar & Grill, I was not disappointed. Yes, they have great lemonade, as well as superb food. I learned something new about Oregon- there are lots of Arizona Cardinals fans here. Below is Brooks Park, along the banks of the Deschutes. I soon found myself in another unexpected treasure: Newberry Volcano National Monument. This is one of a few national monuments run by the US Forest Service, rather than by NPS. I took the road to the top of a cinder cone, in the North Unit of the Monument, and spent a little time near the Visitor’s Center, afterward. This volcano exploded some 7,000 years ago. The Middle Sister comes into view, from the top of the North Cinder Cone at Newberry. On my way to the car, a little park resident was busy with its supper. The day drew to a close, with a near-perfect sunset, at chilly and gorgeous Crater Lake, Mount Mazama’s gift to posterity. The only drawback of being on the north side of this quiet gem at sunset is- the lake is not in the foreground. 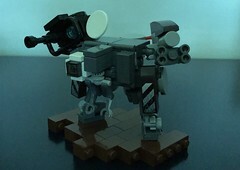 It is still a thing of beauty, though. These days, one after another, have been amazing. Next up: The Rogue River Valley and northern California’s own Volcano Highway. 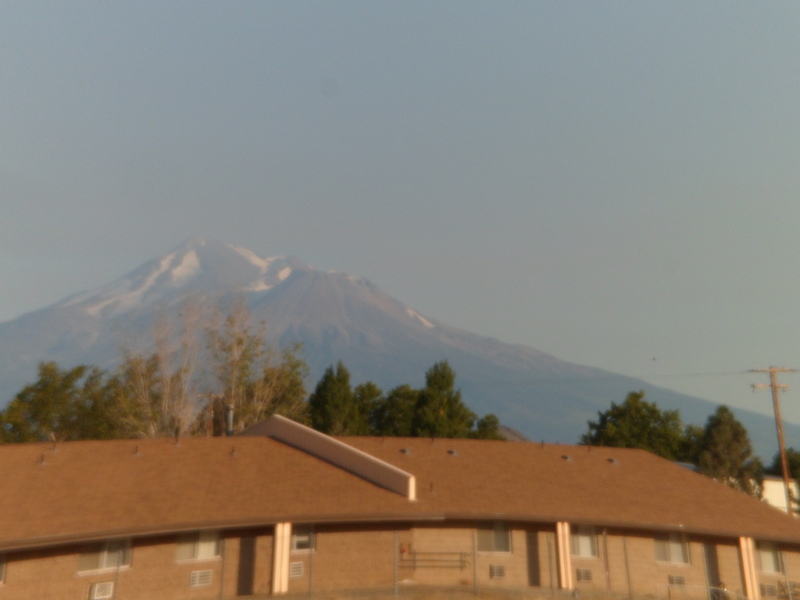 The Ponderosa Motel, in Goldendale, is one of the most welcoming places in which I have taken a room, so far this trip. Operated by a cheerful young couple, with help from a grandma, the place offers large, comfortable rooms, at bargain prices, with a real breakfast- no packaged goods at inflated prices. I checked out the Goldendale Observatory, but as it didn’t open until 2 PM, I photo’d the grounds and went back to town to do laundry. Goldendale has its share of nice little shops, many of which close at Noon on Saturday. I did get a slice of Sheena’s apple pie, to go, before she and Shane went home for the weekend. Yesterday and today, I had lunch at neighborhood bars. In Wenatchee, that was The Igloo. Here in Goldendale, it was The Top Hat. Both had good food. I was the one drinking iced tea. Leaving Goldendale, I passed through the stark beauty of the Columbia Plateau, which would surround me clear to Maupin and the Deschutes River. Three miles south of Goldendale is the Maryhill Museum, which features Native American art, the works of Rodin, an exhibit on the Fin de Siecle American entertainer Loie Fuller, some decorative art exhibits and a hall devoted to Queen Marie of Romania, who ruled the country with her husband Ferdinand I, in the 1920’s and 30’s. Outside of the museum, one may enjoy fine views of the Columbia River Gorge. Below, on the left, is John Day Dam. I spent about two hours in the museum, which does not allow flash photography, an dmy camera has no shut-off on the flash. No matter- I learned a great deal about each of the themes. The museum itself was founded by Samuel Hill, a merchant from Illinois. Maryhill is named for his wife, Mary. The Hills were good friends of Queen Marie and King Ferdinand, and the royals were key benefactors of the museum. Queen Marie, a granddaughter of Britain’s Queen Victoria, was a member of the Baha’i Faith, and, though British by birth, thoroughly immersed herself in Romanian culture and language, becoming one of the country’s most revered rulers. Being committed to world peace, she became fast friends with Sam and Mary Hill, who were Quakers. The Museum’s Native American collection is, naturally, emphatic on Columbia Plateau, Great Basin, and Northwest Coast art, but has items from all other regions of the U.S. and Canada. The Rodin collection features all three of the artist’s media: Sculpture, paintings and sketches. His concern with Dante’s Inferno is well-presented, as are his great works, such as The Thinker. A delightful section has two rooms devoted to chess pieces. There are an amazing variety of chess sets, from all parts of the world. Finally, there are illustrations of six Grimm Fairy Tales, by the British artist, David Hockney. After leaving Maryhill, I focused on a couple of other areas along the Gorge- Horsethief Butte and the bridge to The Dalles, Oregon. Here are two views of Horsethief Butte- South Ridge, then North Ridge. Leaving Washington State gave me mixed feelings, but I enjoy Oregon also, so on we went to The Dalles. This is The Dalles-Dallesport Bridge. The Dalles has a fine frontier-themed museum, Fort Dalles. It was closed when I arrived, but I took some photos of the buildings. First is the Anderson House. Next is the fort’s Headquarters. Fifty miles west of The Dalles is Mt. Hood, seen far in the distance below. My final photos of the day came into focus at Maupin, OR’s Deschutes River Park. This is a major rafting center, and the white water looks fabulous. I stopped for supper at a rest area about ten miles south of Maupin. Finding all the restrooms clogged, three of us called the ODOT number. Within ten minutes, two crews showed up and got on the task. That’s not too shabby for a Saturday night. Now, I am settled in at a KOA in Culver, OR, between Madras and Redmond. Things keep going well on this “about face”. The last day of summer stirred, fresh but still very smoky, in East Wenatchee. I had the pleasure of staying overnight with these fine folks. After freshening up, breakfast, morning prayers and writing my Seattle post, I was off to see the condition of Wenatchee, in the ongoing struggle with relentless smoke. It was not as thick as yesterday’s, but visibility was, as yet, not too good. Nonetheless, I stopped at Riverside Park, for further prayer and reflection. This could be any misty morning, along the Columbia River, but the smoke was palpable still. The air was a bit clearer when I got to Wenatchee’s centerpiece, Ohme Gardens, on the north side of town. There is a complete arrangement of nature here: Great trees, flowers, rock, water, and manicured Victorian-style lawns. Just outside Ohme Gardens is a stark reminder of Wenatchee’s location, at the divide between the green Cascades and the brown that covers much, but not all, of the Palouse. The interplay between the Palouse and the Columbia River is much in evidence, in the area between Wenatchee and Quincy, the next sizable town to the east. As I got past the bustling city of Yakima, I spotted Yakama Nation Cultural Center, in Wapato. This fascinating culture would be well worth a trip north, in and of itself, one of these days. Alas, the center was about to close when I got there. The motels I checked nearby were far too pricey and there was no camping in evidence anywhere nearby, so I moved on. I made a brief stop at Toppenish National Wildlife Refuge, before continuing on to Goldendale. This wetland is vital to sustaining the web of life in a largely dry area north and east of the Cascades. 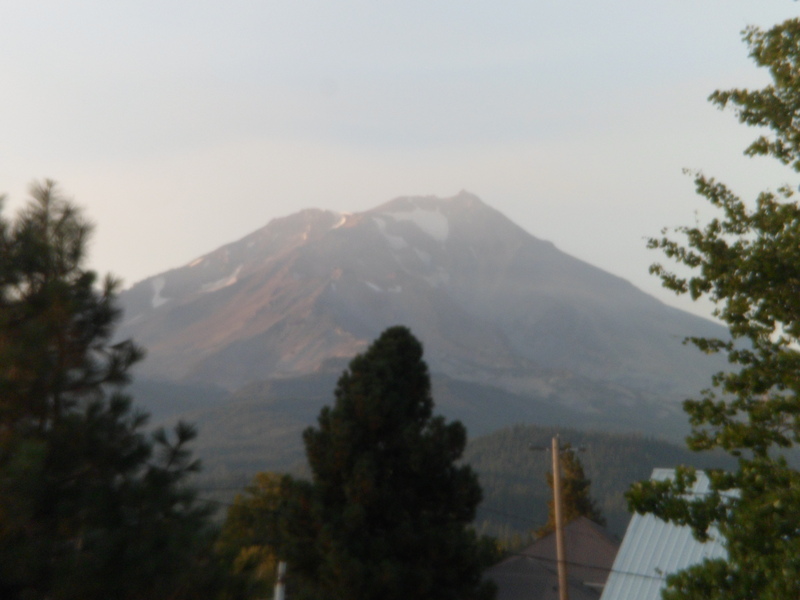 Next: Goldendale, Columbia Gorge and on to Bend, OR. I did some thinking about Thursday, September 20- and my itinerary. Vancouver, BC had beckoned, for quite some time. I was to head up there yesterday. Then came the confluence of three fires in the Cascades above Wenatchee and Cashmere, WA. Where there is smoke and fire, there needs to be spirit to counteract them. A devotional meeting had been planned in the town of East Wenatchee for some time. When I was told of it, on Wednesday morning, and saw the flames above Blewett Pass, the gathering became something I would not think of missing. Vancouver, BC would wait until 2015. So, I headed out yesterday, about noon, got the car serviced in Issaquah, just east of Seattle and arrived in East Wenatchee at 5:15 P.M. In between, was Nature’s fury. We had all elements of a successful spiritual meeting last night- welcoming hosts, heartfelt prayers, a solid topic of focus, and a variety of age groups and perspectives. Then, there was the 800 pound monster, hovering above us all. The children created intense and detailed works of art, while adults discussed the nature of the soul and life after death. They haven’t been in school for a week, due to the smoke. More than anything else, the health threat to children and seniors is the biggest reason to do all possible to bring things back to normal in central Washington, or anywhere where there are natural disruptions. People around Wenatchee said it is like the Mount St. Helens eruption, all over again. I hope it doesn’t last anywhere near as long. With hundreds of dedicated firefighters on this one, the hope has a good chance of coming true. Seattle has nothing to do with the Land of Oz, though Dr. Oz is ubiquitous on the TV here. I arrived by ferry, from Bainbridge, on Tuesday evening. Meeting my friend, Ted, in Chinatown, I then went with him to a place called Mike’s Noodle House. Brisket noodles hit the spot after the ferry ride and rather dicey drive up a 40-degree incline that leads from the Waterfront to Chinatown. The view of Seattle’s stadia from Ted’s neighbourhood is awesome, even at dusk. I digress, though. It was Wednesday that was my main day to explore Seattle. Ted and I started at Lake Washington. A short time later we stopped in Chinatown, and went to the Amitabha Buddhist temple, which is served by two nuns. The nun who greeted us is from Burma (Myanmar). We spent several minutes in prayer and reflection in that refreshing environment. The nun graciously gave me several texts. This is auspicious, as we Baha’is view Baha’ullah as the embodiment of the Buddha Amitabha (Future Buddha), Whose coming was foretold by Gautama Siddhartha. We headed next to downtown, where I ensconced myself in the Library, whilst Ted tended to other business. Along the way to the Library, there were some interesting sights, including China Gate, King Street Station, and the Smith Building. No visit to Seattle is complete without a visit to a waterfall. This park is just south of the Smith Building. Upon finishing our individual business, we headed towards Pike Place. The intervening territory is inhabited by some curious beings. Ted is the being on the right! Then, there is Maximus Minimus, the Barbecue Emperor. Pike Place itself has a gazillion shops and eateries. We chose Athenian Seafood, with its harbor views, for lunch. Of course, there were several stops for artisan cheese and other road food, afterward. Below are three Pike Place scenes. This last photo is a view of Puget Sound from Athenian Seafood. Next up was the Waterfront, with its totem pole. We spent about forty minutes at Vital Tea Leaf, at the north edge of the Waterfront. Vinny graciously explained the tea preparation process and offered several varieties of tea. I chose Puer, which helps with digestion. The shop also has wood sculptures, which are one-of-a-kind. Here are a dragon and a tiger, which represent my son and myself, horoscope-wise, respectively. Our last excursion was to Seattle Center, and the Space Needle. I went alone to the Observation Deck. There is a lovely outside garden, on the grounds of Space Needle. Here are three views from the Observation Deck. After descending from the spectacular height, I spent a little time looking at some aphorisms that are engraved into stones in Seattle Center’s plaza. Here is a parting thought for this very special day’s post. There are few places that outmatch the great cities of the Northwest- Seattle and Portland, each vibrant and forward-looking, in different but complementary ways. 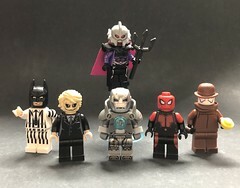 I am grateful for having had time to get to know each of them better. Now, it is time to head slowly back towards Arizona. I will see Vancouver, God-willing, in 2015. Spokane, too,will wait until another time, as my friend there has different plans for the weekend. Next is Wenatchee, suffering and determined to get through the tests of fire. In the 1980’s, Penny and I made a list of places we wanted to see together. The idea of a trip up the coast, “The Whale Trail”, came into our collective mind. We would go to Santa Cruz, Coos Bay, Astoria, Grays Harbor, Neah Bay, Port Renfrew, the (then) Queen Charlotte Islands and southeast Alaska. Time constraints, continuing education and money issues rained on that parade, and we did make it to Santa Cruz once or twice, but never beyond it. All these years later, with our son raised and now living his own life, my spirit-soul mate and I finally made it to Coos Bay, Astoria, the Grays Harbor/ Ocean Shores region and, Tuesday morning, to Neah Bay. I spent Monday night sleeping under the blessed stars at Lake Ozette’s Lost Resort. Once or twice, I awoke during the night, glanced up and saw two stars directly above me, looking like a pair of eyes. Just before dawn. I awoke for the day, looked up, and saw one star, appearing like a heart beaming down at my heart. Upon getting myself together, I went up to the office and found Lost Resort’s owner, who was somewhat befuddled that anyone would be up and about at such an early hour. There were, actually, about six of us wandering about. He took my payment, excused himself and I also moved along, to photograph my surroundings. Below is Lake Ozette itself. The owner left a message for all who came while he was gone to Forks. So, on do we all go. I headed up the hill to Neah Bay. Along the way, there are views of the Straits of Juan de Fuca and of Vancouver Island. I was glad to find, open for business, the Warmhouse, upon arriving in Neah Bay. The Makah people mean it, when they say “Welcome”. Of course, there is a $10 fee for using the trails, but it’s good for a year. After biscuits and gravy, coffee and a bit of conversation with some of the Makah and a pair of motorcyclists from Idaho, I went on towards Cape Flattery, the northwestern-most point in the contiguous 48 states. First, though, a stop was in order at Fort Nunez Gaona DIAH Veterans Park. This spot pays homage to the brief occupation of the area by the Spanish in the 1760’s (thus, the name Juan de Fuca being attached to the strait just north of here, as well as the San Juan Islands, at the north end of Puget Sound.). It also lists the names of every Neah Bay resident who has served in the nation’s military, living or dead. “Diah” is the original Makah spelling of Neah Bay. Below is a view of Neah Bay itself. Those with several days to spend here may hike down past Hobuck Beach, to Shi-shi Beach and the old settlement of Ozette (U’cit, in Makah), which was the original home of the Makah people, west of the present-day lake of the same name. Neah Bay was the U. S. Government’s established reservation site for the Makah. Ozette gives me a reason to return, someday. Cape Flattery Trail is largely planked, making the area easily accessible to many who would otherwise have difficulty. It is a 3/4 mile journey, each way. Above is the trailhead to Cape Flattery. Below, is the split between the north and south points of the cape. Here are some of the sea caves which riddle Cape Flattery, and which may be the downfall of the cape above. Just off the Cape, lies Tatoosh Island, a gull nesting site, which is also sacred to the Makah. I spent about forty minutes at the Makah Cultural Museum. at the north end of town. After bidding farewell to Neah Bay, I headed for the Straits Coast, towards Port Angeles. The first town one encounters on this route is Sekiu. Along the way, there are views of the Olympic Range to the south. Port Angeles is a major hub for the Straits Coast. Here, one may take a ferry to Victoria, BC. Here, people come from all over the northwestern corner of Washington to meet their supply needs. Here, one may swim in the Strait. I visited Feiro Marine Life Center, and met the resident octopus, among other tenants. East of Port Angeles lie Sequim, Jamestown, and Sequim Bay. The s’Kallam people are stewards of this area, much as the Quinault, Hoh, Makah and other peoples are along the west coast. Lastly, the evening found me on the ferry from Bainbridge Island, on the west side of Puget Sound to Seattle.